"Kings of Wessex" redirects here. For the school, see The Kings of Wessex Academy. This is a list of monarchs of Wessex until 927. For later monarchs, see the List of English monarchs. While the details of the later monarchs are confirmed by a number of sources, the earlier ones are in many cases obscure. 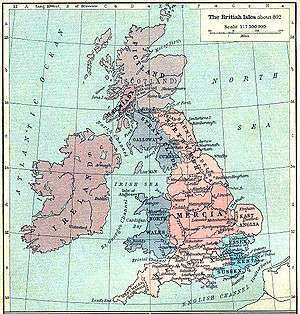 The names are given in modern English form followed by the names and titles (as far as is known) in contemporary Anglo-Saxon English and Latin, the prevalent 'official' languages of the time. This was a time when spellings varied widely, even within a document. A number of variations of the details below exist. Amongst these are the preference between the runic letter "Thorn" (Þ) and the letter "Eth" (Ð), both of which are pronounced "Th" and were interchangeable. They were used indiscriminately for voiced and unvoiced sounds, unlike modern Icelandic. Thorn tended to be more used in the south (Wessex) and eth in the North (Mercia and Northumbria). "Th" was preferred in the earliest period in Northern texts. Except in manuscripts, runic letters were an Anglian phenomenon. (The early Engle restricted the use of runes to monuments, whereas the Saxons adopted Wynn and Thorn for sounds which did not have a Latin equivalent. Otherwise they were not used in Wessex). ÆLFRED MAGNVS REX SAXONVM OCCIDENTALIVM The only Anglo-Saxon monarch to be given the epithet "the Great". ÆÞELSTAN REX SAXONVM OCCIDENTALIVM Became King of the English in 927 when the Northumbrians accepted his lordship. The chart shows their (claimed) descent from the traditional first king of Wessex, Cerdic, down to the children of Alfred the Great. A continuation of the tree into the 10th and 11th centuries can be found at English monarchs family tree. The tree is largely based on the late 9th-century Anglo-Saxon Chronicle, the West Saxon Genealogical Regnal List (reproduced in several forms, including as a preface to the [B] manuscript of the Chronicle), and Asser's Life of King Alfred. These sources are all closely related and were compiled at a similar date, and incorporate a desire in their writers to associate the royal household with the authority of being a continuation of a unified line of kingship descended from a single original founder. One apparently earlier pedigree survives, which traces the ancestry of King Ine back to Cerdic. This first appears in a 10th-century manuscript copy of the "Anglian collection" of Anglo-Saxon royal genealogies. The manuscript is thought to have been made at Glastonbury in the 930s during the reign of King Æthelstan  (whose family traced their own royal descent back to Cerdic via a brother of King Ine), but the material may well date back to the earliest reconstructable version of the collection, c. 796; and possibly still further back, to 725-6. Compared to the later texts, this pedigree gives an ancestry for Ceolwald as son of Cuthwulf son of Cuthwine which in the later 9th-century texts sometimes seems confused; and it states Cynric as son of Creoda son of Cerdic, whereas the Chronicle annals go to some length to present Cerdic and Cynric as a father-and-son pair who land in and conquer the southern part of Wessex together (a narrative now considered spurious by historians). Many of the links shown are disputed. Egbert, who became King of Wessex in 802, was probably of Kentish origin, and his ancestry back to Cerdic may have been invented to legitimize his claim to the throne of Wessex. There are also a number of discrepancies between different sources. ↑ Dumville (1976), pp. 40, 42, 46. It is also possible that the material may first have been joined in with the collection in a copy made in Mercia c.840. Yorke's theory "has met with general acceptance (I cannot find any historian or archaeologist that disagrees with her conclusions)", according to Robin Bush at "Were the West Saxons guilty of ethnic cleansing?". Time Team Live 2001. Channel 4. 2001-08-28. Archived from the original on 2006-02-19. "Family tree of the Kings of Wessex and England 802–1066" (PDF). The official website of the British Monarchy. Retrieved 2010-07-30. "Family tree of Kings of Wessex and England 802–1066" (PDF). The official website of the British Monarchy. Retrieved 2011-03-30.